President Authorizes Relocation and Internment of Citizens for "National Security"
WASHINGTON, DC - The President has released the following executive order, which allows the relocation and internment of any resident of the United States, including citizens, which may be considered a risk to national security, and authorizes the usage of Federal troops to perform such relocation and internment. The year was 1942. The President - Franklin D. Roosevelt. 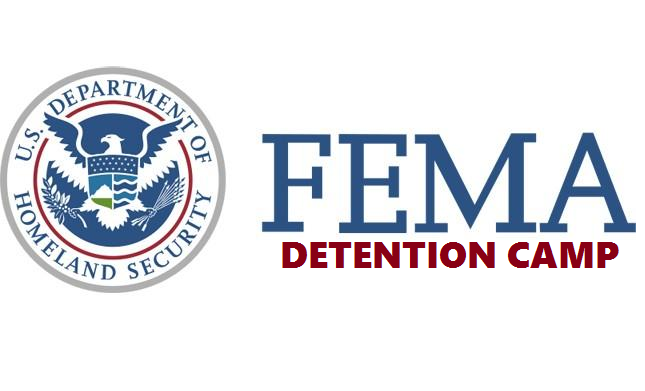 FEMA didn't exist yet. 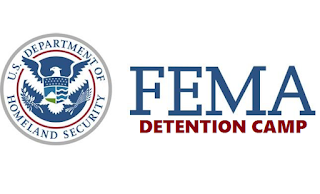 FEMA camps weren't even a conspiracy theory yet. However, thousands of American citizens and legal residents were relocated and placed in internment camps across the United States. All in the name of National Security. How quickly we forget that both parties, Democrat and Republican, have committed human rights violations. We spend so much time arguing over immigration and religions that we lose sight of the fact that jihadists are the reaction to our actions in the middle-east. Maybe instead of trying to stop immigration, we need to stop bombing countries, stop interfering with the politics and regimes of foreign countries, and worry about taking care of our own problems here at home. In 2016 alone the US dropped over 26,000 bombs, and at the same time approximately twenty veterans committed suicide each day, and there were over 500,000 homeless in the United States. Don't let politics divide us. Work together in your communities to fix our problems, locally and nationally. And if the time comes, stand up for each other. Give a voice for those who have no voice. Come together as one people. Spread love, not hate. Screenshot of WBAL article, used under fair use. 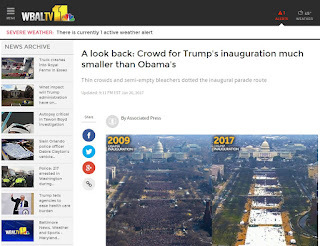 BALTIMORE, MD - WBAL-11 TV continued the trend today of fake news by mainstream media by publishing a misleading photo of the 2017 inauguration of Donald Trump. 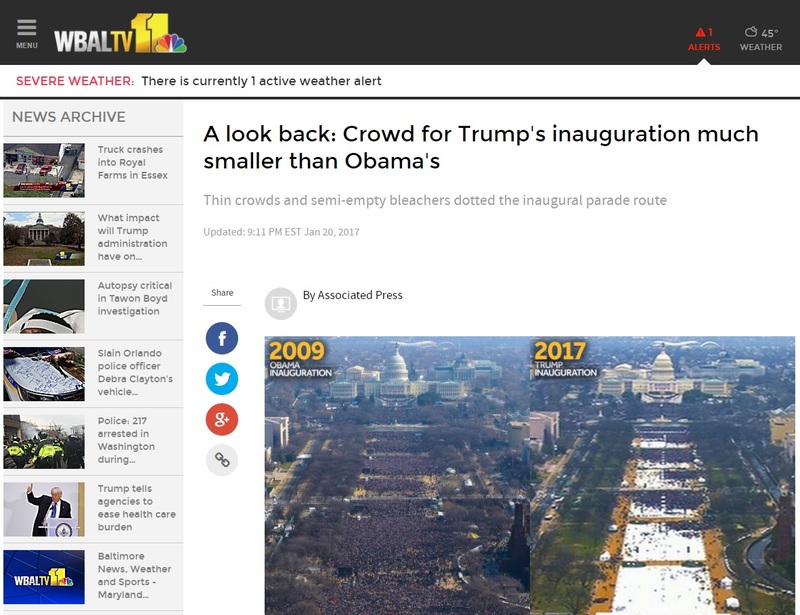 In the WBAL article, the TV station claimed that Trump's inauguration was "much smaller" than Obama's, and included a photo which was most likely taken in the early setup stages of the inauguration. According to Heavy.com, the Trump inauguration was most likely approximately 900,000, which is indeed about half of the attendance at Obama's first inauguration. However, the Heavy.com photos show a much larger crowd than the photo by WBAL, filling the entire mall. An interesting note by Heavy.com, however, is that only 800,000 attended Bill Clinton's first inauguration, and only 300,000 attended George Bush's inauguration in 2001. Is it any wonder that Americans are losing faith in news media? According to a September 2016 Gallup poll, only 32% of Americans have a high amount of trust in news media. This is an all-time low, and definitely hasn't been helped by recent events. We at Liberty Chronicle Independent strive to report accurate news, providing quality over quantity. We currently have no advertisers, and no paid staff - all articles are volunteer contributions. Normally, I would completely support protesting Big Government and the Militarized Police State. Sadly, I can not tomorrow. I could continue this list for hours, but I want to get this piece out tonight rather than next week. I am closing this with a video of the Seattle Anti-Trump Protest I attended on November 13, 2016, a few days after Trump had been elected by the Electoral College. I wanted to give coverage of the protestors to show that they were not violent, that they were just out there to express concern. I was dressed in a black suit and tie, with my press credentials showing clearly I was with the Press and was there to cover the event; I had no political attire or affiliations on or with me. I was the only journalist to cover the event from start to finish, walking with these folks for miles in the rain. I had contracted Walking Pneumonia that I had to fight for over 2 months to recover from. As you can see, I had gone into this giving it everything I have as I always do when covering something, almost 4 hours worth of video coverage. 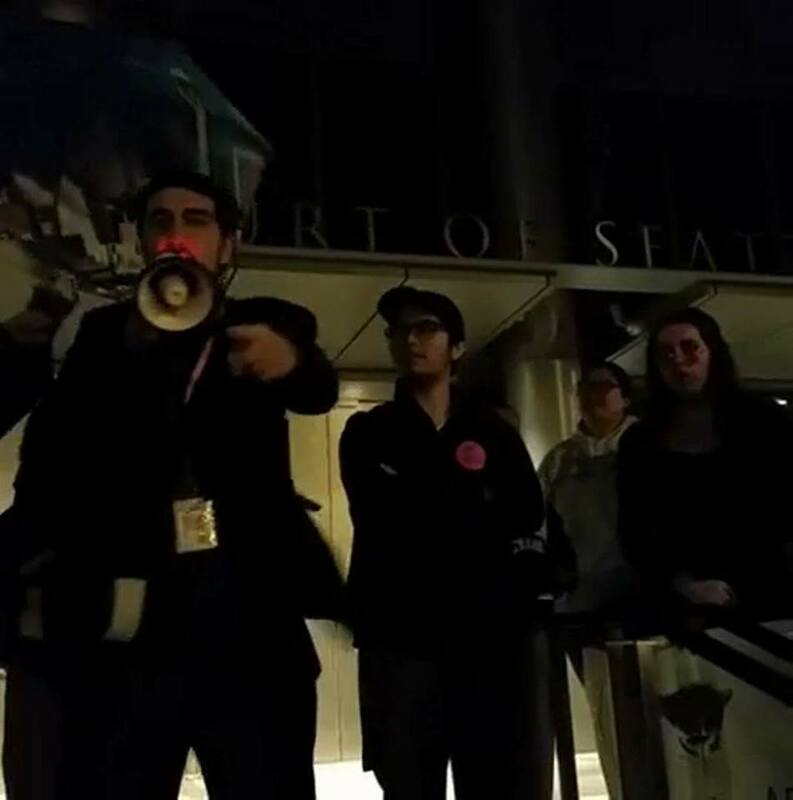 At the very end of the protest, I spoke on a bullhorn to the crowd that had dwindled down from 400+ to about 30 people. I wish I could say the experience was overall a great one, but it was not. I was attacked from nearly the start by random folks, yelling in my face and attacking me in crowds. I posed no threat and was there to help these people get exposure. I was a man of the Press and I was seen as the enemy. You don't have to just take my word for it, feel free to watch the video. A journalist shouldn't have to defend themselves for covering a live event in a public place. I was doing them a favor by being there and giving them uncut, uncensored coverage. What did I get in return? The Walking Pneumonia for 2 months that I had mentioned and looked down upon like I was subhuman. This Piscataway Native that they claim to stand up for, put me down. I never experienced such bigotry in my life until moving to Seattle. So I can not stand with you, Protestors; you have made me your enemy without even realizing I was trying to cover you in a positive light. I waited months before finally writing and officially publishing this video in an article because of how disappointed i was at them. We wanted to stand with you, people of the "left;" but you chose to stand against us. The following contribution is from Seattle-based independent journalist, David Malekar; who regularly publishes content to the WashCo Chronicle and other online publications. The interviewee, Logan Fleckenstein, is the former 60th's State Representative in Michigan as a Libertarian. You can follow Logan on Facebook for more information at facebook.com/LoganFleckenstein. DM: It's a pleasure to have you back at the LCI for another round of questions. Today is Martin Luther King Day and I wanted to discuss with you some pressing civil rights issues we are facing in the Libertarian Party, today. What happened to the widespread talk about the Militarized Police State from Libertarians as a whole? They were very vocal about it during the Bush administration but slowly faded into a halt after "Black Lives Matter" emerged. LF: That's an excellent question. Honestly I've wondered the same thing myself. I think some of it has to do with the fact that many libertarians have been increasing hostile to anything that might even have the possibility of being SJW related. Of course this isn't to say police militarization is exclusively a social justice issue nor to say the hostility towards SJWs isn't for understandable reasons. I think topical issues get so ingrained into media that legitimate issues can get lost in all the information being blasted at us. I will say as a side note many left leaning libertarians (and right leaning) I personally know care deeply about this issue. DM: We have seen the number of LEO caused civilian deaths increasing during Obama's administration vs Bush. How do you propose we break the ice on this issue that is more out of control than ever? Again, Libertarians as a whole have become cold to the topic. LF: Well one hope I have with the Trump administration is that the anti-war movement in general will be sparked back to life again. Maybe if President-elect Donald Trump is overall less hawkish than both Presidents Obama and Bush he will manage to get re elected. This is good in some potential short term reduction in hawkish policy. Also important is this inspires libertarian-Republicans and anti war progressives to join forces on foreign policy issues. If Trump doesn't reduce LEO caused civilian deaths this potential libertarian-go/anti-war progressive coalition will fight him on it. Also I don't see how someone already so disliked would be re elected. DM: Do you believe the Libertarian Party as a whole understands how much ground it has/potentially has lost with those individuals who live in those secluded areas where local police corruption runs wild? Cities like Chicago, Baltimore or even states as a whole like California and Maryland? LF: No I really don't think many do. I think there is a bit of an awakening since the exposure of some of the white nationalism going on in the alt right. Many Libertarians have a semantics problem. The problem is that while SJWs rely on identity politics this doesn't mean all identity issues are illegitimate. Just because Timmy cries wolf too many times doesn't mean there isn't a wolf when Susan says there is one. If a majority of Libertarians understood the potential they were losing with these urban folks they would be out there trying to connect with them. Libertarians need to realize that people in these areas are a prime example of the results of (leftist) authoritarianism. DM: Why do you suspect the subject of the largest police backing organization, the Fraternal Order of Police (F.O.P.) seems to avoid criticism despite being one of the large financial backings for Law Enforcement court fees, etc.? LF: Honestly this is something that's puzzled me for a bit. If I had to guess I would assume it is because people working for the F. O. P know how to make sure the organization can avoid criticism. The political game is a nasty one and if you know how to play it you can have a lot of success at the expense of others. The way to beat them is to understand their tactics and counter them. DM: There has been improvement with police body cams, but there have been some "technical difficulties" where devices "are off," etc. Do you believe that police body cams that can not be turned off or have their memory card remover once an officer's shift starts, will further reduce abuse from all parties involved? LF: On paper I can see how that would work. I think it is certainly something that should be tried if feasible. Obviously avoiding "technical difficulties" as much as possible is ideal. DM: If you could amend the Civil Rights Act of 1964, what would you change, if anything? LF: Yes, I want the Civil Rights act to focus on how government (or any business that gets government money for whatever reason) treats people and leave private businesses alone. Clearly the Civil Rights act hasn't solved many serious civil rights issues the government itself is involved in. I think by focusing where the civil rights applies it can become more effective. DM: Mr. Fleckenstein, thank you for taking the time today to address a lot of different questions regarding civil rights on Martin Luther King Day. 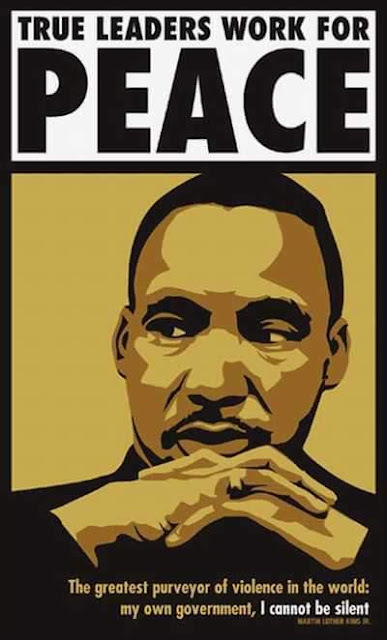 What closing thought would you like to add in regards to the future of Libertarian action for Civil Rights? LF: Thank you for having me Mr. Malekar. Libertarianism is a perfect fit for the Civil rights movement. Libertarians not trying to build a bridge with that movement is wasting an opportunity to address many different issues like the war on drugs and militarized police, to name a few. 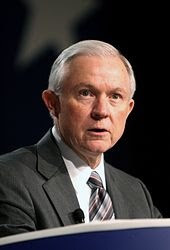 The Libertarian Party warns U.S. senators to quickly reject the nomination of Sen. Jeff Sessions for the position of attorney general. Marijuana is a relatively mild drug with far fewer harmful effects than alcohol. Labeled, quality-controlled marijuana products are far safer than unlabeled, untested black-market drugs. Drug warfare drives up crime which endangers Americans and terrorizes the people of supplier countries, such as Mexico. The demand for drugs remains unabated under prohibition. One-third of Americans have used marijuana, and despite strict penalties against narcotics, heroin use is an epidemic that now kills more Americans every year than do automobiles and homicide, combined. As a grassroots movement to legalize marijuana sweeps the country, Sessions wants to enforce federal prohibition laws in the eight states that have legalized recreational marijuana. “Sessions is terrible when it comes to civil liberties,” notes Sarwark. “He wants a bigger U.S. government spy apparatus that snoops on Americans’ e-mails. He wants police officers to continue to steal Americans’ stuff through civil asset forfeiture. He advocates for discrimination based on religious beliefs, in violation of the Constitution. Libertarians enjoy growing support from millennials, who are claiming a larger block of the American vote and who are helping more and more Libertarian candidates beat the margin of victory in top-ticket races. Libertarian Joe Miller for U.S. Senate in Alaska won 29 percent of the vote in the November election, coming in second, ahead of the Democrat. Americans cast almost 20 million votes for Libertarian candidates in the 2016 general election. The Libertarian presidential candidate, Gov. Gary Johnson, appeared on the ballot in all fifty states, plus the District of Columbia.